February 8, 1917: Municipal Journalarticle. 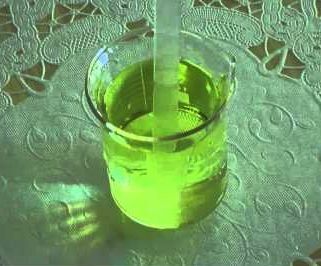 Test for Chlorine in Water. “Control of Disinfection Process by Ortho-Tolidin Test, With Colored Glass Plates as Color Standards-How to Prepare Plates. By Francis E. Daniels. For an intelligent control of the process of disinfection of water supplies it is highly essential to make frequent use of some quick chemical test in order to be sure that the disinfecting agent is being applied in the proper amounts at all times. By means of such a test the writer has frequently detected improper dosing in a few minutes. Low doses due to breaks, stoppages in feed control apparatus, improper mixing of chemicals, or weak hypochlorite have been shown by such tests, as also overdosing. On more than one occasion it bas been observed that no hypochlorite had been put in the solution tank—only water being fed through the dosing apparatus. Such a test therefore is very useful for the inspector; but it is more useful to the man in charge in that it gives him a ready means of satisfying himself that the dose is exactly what he has been instructed to make it. It also gives information days in advance of the completion of bacterial tests. The disinfection by chlorine or its compounds at a good many water plants has been controlled by the so-called starch-iodide or Sims-Woodhead test. This is quite satisfactory in many places, but it is not so delicate and is more cumbersome for the inspector than another test known as the ortho-tolidin test. The ortho-tolidin test was discovered and used by Prof. Phelps and the writer in 1907; but it was later improved by Messrs. Ellms and Hauser. It is to appear again in the new edition of the Standard Methods of Water Analysis of the American Public Health Association. Commentary: Earle B. Phelpsfirst revealed his discovery of orthotolidine and its ability to detect chlorine during his testimony on May 11, 1909 at the second Jersey City trial. Reading Daniels’ article reminds us all how fortunate we are to have such good analytical methods to tell us how well we are doing in the killing of pathogens. In the early part of the 20th century, they were just beginning to develop the tools they needed to get the job done. Daniels, Francis E. 1917.“Test for Chlorine in Water.” Municipal Journal. 42:6(February 8, 1917): 197. McGuire, Michael J. 2013. The Chlorine Revolution: Water Disinfection and the Fight to Save Lives. Denver, CO:American Water Works Association. This entry was posted in Year 7 TDIWH and tagged analytical method, chlorine, chlorine residual, drinking water, Earle B. Phelps, orthotolidine, public health, The Chlorine Revolution, water, water history on February 8, 2019 by safedrinkingwaterdotcom.